The Working Title 7 writing group and reading series held their most recent event at Watchung Booksellers in Montclair, NJ. The group, comprised mostly of Montclair residents, has been together for over twelve years. They meet monthly to workshop drafts and discuss craft. Once a year, they host a reading, calling it “grass roots fiction at its best” that’s open to the public to showcase their latest efforts, try out new material, or promote new titles. On June 10th in the back corner of Watchung’s children’s section, Nancy Burke, one of the founding members, emceed the evening of stories, which ranged from creative nonfiction to young adult to sci-fi. The night started with Donna Brennan, who received the Jane Austen finger puppet for her novel in progress, Cold Dusted Hearts. With voices, hand gestures, and eye rolls, Brennan had the audience laughing out loud as she read about family dynamics displayed during a dinner party and a hopeful set up, or “attack plan,” of two singles at the table. There is also something sentimental yet apt about having a reading in the children’s section of the store, amongst all the titles that inspired many young writers. The audience sat at attention with cups of wine or bites of cheese, eager for story time. Right above the mic stand words from The Secret Garden read on the wall: “The flowers are growing—the roots are stirring.” Such a classic quote seems all too fitting for a grass roots writing group. 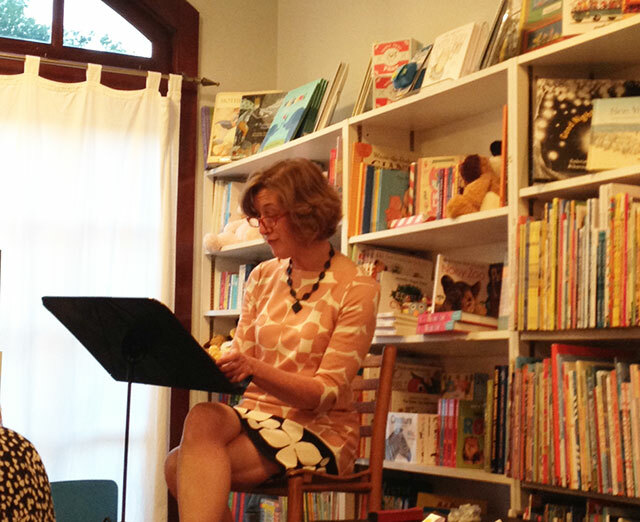 The reading continued with Priscilla Mainardi, aka the Dostoyevsky of the night, who shared “Kayak Tour,” a short story recently published in Blue Moon Literary & Art Review’s tenth issue. The piece explores the heartbreak of divorce through the eyes of a young girl. Next, David Popeil performed his work in progress about the year 2053 where books are illegal, replaced only by direct images. As such a future would be a horror to all in attendance, Popeil was awarded the Poe puppet. Burke’s piece “He Briefly Thought of Tadpoles,” published in Meat for Tea: The Valley Review, was about a couple struggling to conceive. It describes a frustrating yet revealing car ride the husband has on his way home, featuring the GPS voice Marcia and her constant, all-knowing recalculations. Karen Abarbanel, who received both Dickinson and Wilde puppets, closed the reading with her historical fantasy novel, telling the audience about the festival of shells and a young heroine’s night before she goes off to live with knights. Follow Watchung Booksellers on Facebook to keep up to date on readings and book news.